THE KREMLIN, Russia -- As Ukraine suffers, it is time to recognise the gravity of the Russian threat — and to counter it. He is ridiculed for his mendacity and ostracised by his peers. He presides over a free-falling currency and a rapidly shrinking economy. International sanctions stop his kleptocratic friends from holidaying in their ill-gotten Mediterranean villas. Judged against the objectives Vladimir Putin purported to set on inheriting Russia’s presidency 15 years ago—prosperity, the rule of law, westward integration—regarding him as a success might seem bleakly comical. But those are no longer his goals, if they ever really were. Look at the world from his perspective, and Putin is winning. For all his enemies’ machinations, he remains the Kremlin’s undisputed [evil] master. He has a throttlehold on Ukraine, a grip this week’s brittle agreement in Minsk has not eased. Domesticating Ukraine through his routine tactics of threats and bribery was his first preference, but the invasion has had side benefits. 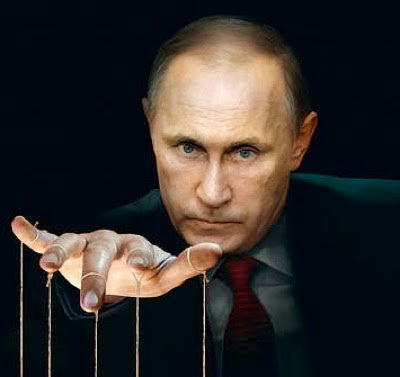 It has demonstrated the costs of insubordination to Russians; and, since he thinks Ukraine’s government is merely a puppet of the West (the supposed will of its people being, to his ultracynical mind, merely a cover for Western intrigues), the conflict has usefully shown who is boss in Russia’s backyard. Best of all, it has sown discord among Putin’s adversaries: among Europeans, and between them and America. His overarching aim is to divide and neuter that alliance, fracture its collective approach to security, and resist and roll back its advances. From his tantrums over the Middle East to his invasion of Georgia and multiple misadventures in Ukraine, Putin has sometimes seemed to stumble into accidental disputes with the West, driven by a paranoid fear of encirclement. In hindsight it seems that, given his outlook, confrontation may have been inevitable. Either way, the contest he insists on can no longer be dodged. It did not begin in poor Ukraine and will not end there. Prevailing will require far more resolve than Western leaders have so far mustered. Last year Putin lopped off Crimea, redrawing Europe’s map by force. The war he hallucinated into reality in eastern Ukraine has killed thousands. Even if the February 15th ceasefire holds (unlikely, on past form), he seems certain to get what he wants there: a wretched little quasi-state in the Donbas, which he can use to stall and warp Ukraine’s development. Yet these incursions [invasions] are only his latest bid to bludgeon former Soviet states into submission, whether through energy blackmail, trade embargoes or war. For Putin the only good neighbour is a weak one; vassals are better than allies. Only the wilfully blind would think his revanchism has been sated. Sooner or later it may encompass the Baltic states—members of both the European Union and NATO, and home to Russian minorities of the kind he pledges to “protect”. The EU and NATO are Putin’s ultimate targets. To him, Western institutions and values are more threatening than armies. He wants to halt their spread, corrode them from within and, at least on the West’s fragile periphery, supplant them with his own model of governance. In that model, nation-states trump alliances, states are dominated by elites, and those elites can be bought. Here, too, he has enjoyed some success. From France to Greece to Hungary he is cultivating parties on Europe’s far right and left: anyone who might lobby for Russian interests in the EU, or even help to prise the union apart. The biggest target is NATO’s commitment to mutual self-defence. Discredit that—by, for example, staging a pro-Russian uprising in Estonia or Latvia, which other NATO members decline to help quell—and the alliance crumbles. Putin’s stranglehold on his own country means he has time and freedom for this campaign. As he has amply demonstrated, he has no qualms about sacrificing Russians’ well-being to satisfy his coterie’s greed or to further his geopolitical schemes. He persecutes [and assassinates] those who protest. And in the echo chamber his propaganda creates, the nationalism he peddles as a consolation for domestic woes is flourishing. The first task for the West is to recognise the problem. Barack Obama has blithely regarded Russia as an awkward regional power, prone to post-imperial spasms but essentially declining. Historians will be amazed that, with Ukraine aflame, the West was still debating whether to eject Russia from the G8. To paraphrase Trotsky, Western leaders may not have been interested in Putin, but Putin was interested in them. The next step is to craft a response as supple as the onslaught. Part of the trouble is that Putin plays by different rules; indeed, for him, there are no inviolable rules, nor universal values, nor even cast-iron facts (such as the downing of flight MH17). His Russia has graduated from harassing ambassadors and assassinating critics to invasions. This is one of his assets: a readiness to stoop to methods the West cannot emulate without sullying itself. Proponents think defensive weapons would inflict a cost on Putin for fighting on. But anyone who doubts his tolerance of mass casualties should recall his war in Chechnya. If arms really are to deter him, the West must be united and ready to match his inevitable escalation with still more powerful weapons (along, eventually, with personnel to operate them). Yet the alliance is split over the idea. Putin portrays the war as a Western provocation: arming Ukraine would turn that from fantasy to something like fact, while letting him expose the limits of Western unity and its lack of resolve—prizes he cherishes. If fresh Russian aggression galvanises the alliance, arming Ukraine will become a more potent threat. Until that point, it would backfire. A better strategy is to eschew his methods and rely on an asset that he, in turn, cannot match: a way of life that people covet. If that seems wishy-washy beside his tanks, remember that the crisis began with Ukrainians’ desire to tilt towards the EU—and Putin’s determination to stop them. Better than arms, the West must urgently give Ukraine as much aid as it needs to build a state and realise that dream (and as much advice as it takes to ensure the cash is not misspent or stolen). The IMF deal announced in February should be only a start. Putin wants Ukraine to be a lesson in the perils of leaning West. It should instead be an exemplar of the rewards. Just as urgently, those former Soviet countries that have joined Western institutions must be buttressed and reassured. If the case for sending arms to the Donbas is doubtful, that for basing NATO troops in the Baltics is overwhelming, however loudly Putin squeals. Western leaders must make it clear, to him and their own people, that they will defend their allies, and the alliance—even if the struggle is covert and murky. And it isn’t only its allies who appreciate the West’s virtues. So do many Russians, including shameless Putinists who denounce the West’s decadence but exploit its schools and stock markets. It is long past time for every Russian parliamentarian and senior official to join the sanctions list. Far from being relaxed as, after Minsk, fellow-travellers may suggest, sanctions must be tightened—and sanctions-busting curtailed. In the end, they will prove a stronger lever than weapons. At the same time, the West should use every available means to help ordinary Russians, including Russian-sympathisers in the Baltics and Ukraine, learn the bloody, venal truth about Putin. It should let them know that Russia, a great nation dragged down a terrible path, will be embraced when it has rulers who treat the world, and their own people, with respect not contempt, however long that takes.